Green gardens and stone walls! Our tour guide Nigel ushered us out of the van with a wide grin on his face and led the way towards the castle. 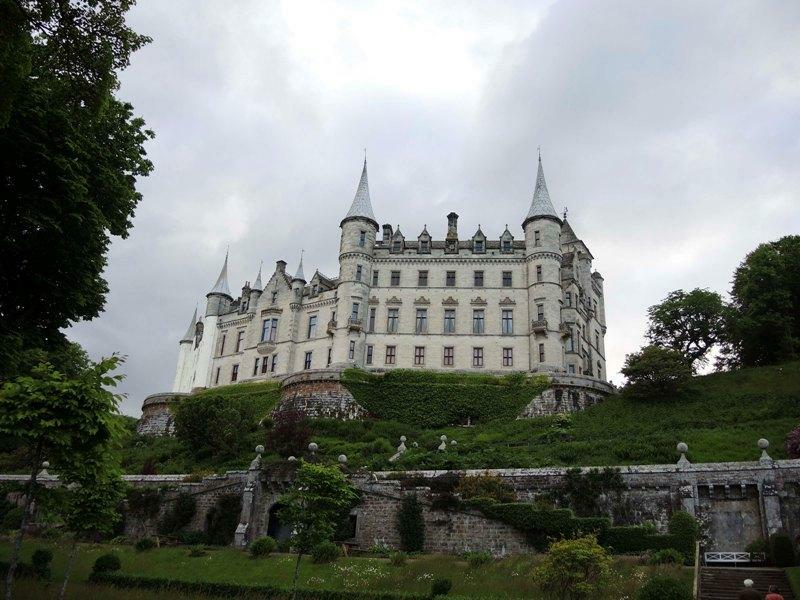 It was overcast, the grey of the sky mirroring the grey stone of Dunrobin’s walls. My mom was carrying an umbrella with her in anticipation of rain. Nigel led us into the castle and, without hesitation, led us right back outside again into the gardens. Where the front of the castle was greyscale, the gardens were vivid technicolor. Despite the lack of sunlight, the gardens seemed a radiant green and blue and yellow filled vast backyard. Down we descended, stone stairs serving as a reminder that the luminosity of the gardens belonged wholly to the grey castle behind us. My grandmother gripped my arm for balance as we followed our tour guide, the leaves hanging over us almost as big as we were. A small group of people were seated on wooden benches, huddled together against the brisk wind that blew through the ground level of the gardens. Nigel indicated for us to choose our seats before walking off to the opposite end of the yard. I sat beside my younger sister. Both of us were unsure of what to expect. No one had told us why we were gathered in the backyard of a random castle out in the middle of Scotland (our ancestral home, as our grandfather adamantly reminded us anytime he got the chance). A drop of rain fell on my brow. My sister and I flipped up the hoods of our windbreakers in near unison. My mother leant over us with an umbrella as Nigel bounded back over to us and threw himself down onto the bench next to my grandparents. He looked expectantly at the field in front of us where a man stood at its center, his back to us and head tilted to the clouds. As tourists, the audience wondered at the way he stood unabashedly in the rain. We waited. He waited. It was silent save for the sound of water hitting the countless umbrellas held up by the castle’s visitors. Out of nowhere, a bird dropped from the sky and landed on the man’s arm before any of us could blink. He turned to us, the look on his face said he knew the display was almost as impressive as the bird on his arm was. “She’s a peregrine falcon,” he explained. He didn’t bother to introduce himself. The audience was too captivated by the powerful animal before them to care. The man threw his arm up into the air and the falcon took flight once more, her feathers just as grey as the castle or the sky, but somehow grander. The falconer took a leather bag from his belt and swung it around in a figure eight pattern. My head swerved to follow the movements of the bird high above us. I moved the umbrella away, no longer caring about getting wet. I was mesmerized with the way the falcon flew. We all were. She dove back towards the ground. The collective gasp of excitement that came from the audience was unique, reserved for the wonder of watching this falcon move through the air. When the man whistled, she landed back on his arm without a fuss, feathers ruffling in the rain. The audience leant forward as one to get a closer look, the magic of the castle paling in comparison to the magic of the falconry that was taking place on its grounds. 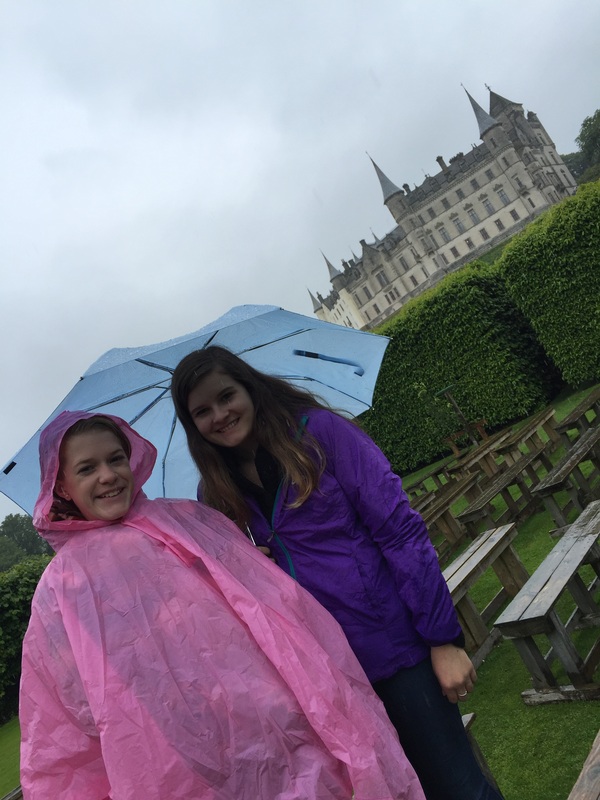 This was Dunrobin- green gardens, stone walls, and falconry amidst the rain.